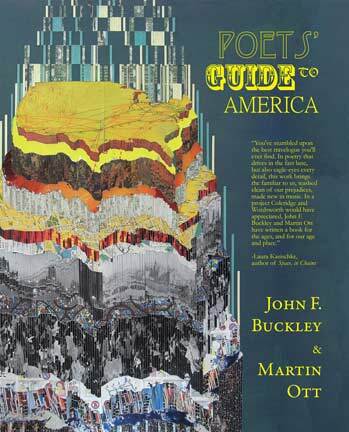 Poets’ Guide to America maps the cultural landscape of the fifty US states and more in the adventuresome and humorous collaborative poetic debuts of John F. Buckley and Martin Ott. You’ve stumbled upon the best travelogue you’ll ever find…a book for the ages, and for our age and place. John F. Buckley and Martin Ott are extremely talented poets, schooled in their craft, who are already well on their way to the “A List” of their generation, and are thought by many—myself included—to be there already. This comprehensive collection will be on the shelves and in the hands of those readers who endeavor to chart the course of poetic art in our time. The tag-team poetry of Buckley and Ott is as much a kin to the works of John Ashbery and Edward Field as it is to the radio skits of George Burns and Gracie Allen. Their euphonious cacophony of wordplay, ingenious turn-of-phrase concoctions, and steady stream of pop/cross-cultural references create an erudite mix of levelheaded nonsense and harebrained smarts. Poets’ Guide to America is, in the truest sense, a road trip, wherein Buckley and Ott take turns behind the wheel, co-writing poems line by line, stanza by stanza. The result is an innovative exploration into Americana that travels over as many dusty back roads as it does major highways. Do yourself a favor and let them take you for a ride. In a scene oversaturated with trite, predictable fluff, it is refreshing to see challenging work of this caliber. I appreciate the ambition, scope, and fantastic weirdness of this collection. A former altar boy and a former U.S. Army interrogator, respectively, John F. Buckley and Martin Ott were born and raised in Michigan, meeting at the University of Michigan-Ann Arbor before separately migrating to California. 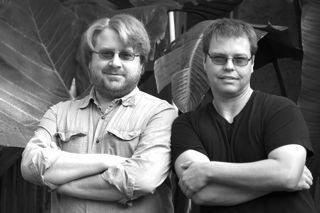 Their friendship evolved into a writing collaboration, and together their work has appeared in over 150 periodicals and anthologies and garnered three Pushcart nominations. Apart from the poetry collections and chapbooks they have published separately, Poets’ Guide to America represents the first book of their collaborations. through tipsy misses in mancaves, first the fathers’, then their teenaged sons’. while in the cellar of a Vermont tavern microbrews are poured for teens. divans, new jack swing singles, and sweet cream puffs fresh from the mini-fridge. sucking from a many-armed hookah, wondering whose hands are whose. mall east of Manila and west of Costa Mesa. They plan to call it The Trench. For now, children chat in Chamorro and play in the pools at the bottom. during the long Nuclear Winter. He places Chardonnay on his Costco list. cans furiously or lackadaisically, depending on prevailing winds from Wall Street. Mining her cellar for jars of green beans and such has saved many in lean times. proved the existence of aliens in the same caves that swallowed Tom Sawyer. for jam sessions and objective feedback on her mail-order specialty contact lenses. mistrust of benign heaps, invented tongues and ululations from our speakers. two-car garages: one level deeper, one beat closer to the human heart. Atlanta is your peach basket, the humid breeding ground of Coke. But what evokes your soul—the complex tang of Coke? My hands cradle the curving bottle, the slick hourglass shape. Burn in my throat, then spin the bottle, sweet childhood of Coke. But now you slip my grasp into the hands of thirsty men. I weep and launch myself in pursuit of the flight of Coke. Everything dark and cold reminds me of you. The red of your label is my blood, the secret recipe of Coke. Your vats hold cola potions and the coda in our spinal fluid. Pepsi lovers unknowingly hum their devotion to Coke. Aunt Rosemary spurns all coffee and tea as bitter pretenders. She slips out at dawn for her monarch, a two-liter scepter of Coke. The downtown plaza flashes with The Real Thing in Hotlanta. Skateboarders and dancers perform acrobatics on the letters of Coke. Shaken-can bubbles spray forth like aerated pollen in springtime. Each arc of froth seeds the wind with a caramelized cascade of Coke. Will I one day wake up as a fly, living in an empty aluminum can? The fizz grows flat in the brainpan caking my imagination with Coke. I’d like to teach the world perfectly harmonious wedding hymns. I spy a reverent moonlit hill, sister wives, brother grooms, married to Coke. My waist loves the aspartame; my rum the lemon-lime boost. I yearn to spelunk for the buried flavor combinations of Coke. John Pemberton and Asa Griggs Candler watch from on high. Two hundred countries sell their concoction, a worldwide web of Coke. On a country road choked with kudzu, a toothless man suckles at happiness. The truth of this, an endless well, is the loneliness of Coke. from the wireless ether and DJed non-stop from the sub-basement brainframe. Muzak was the rock-n-roll of the afterlife channeled through underwater angels. new moon pulled Jimmy Hoffa from the empty trunk of an antique Avery truck. from D. B. Cooper, since damned for all eternity to be unable to spend his money. caffeine failing, your jittery eyes drinking in the pocked highway shoulders. talk at the register. Each of you an epic story of the road. Hints of folly. Footnotes. from the drapes without hope of finding gold flecks. leggings waving on banisters above pale flood lines. fine as beignet sugar. Something pulses and persists. The smell of brass trickles off the street, into our shoes. exist in the many ways our flesh desires flesh. lovingly at what we’ve hauled up. And abandon it. lust of the moon and our matching winks. Beyond quiet.